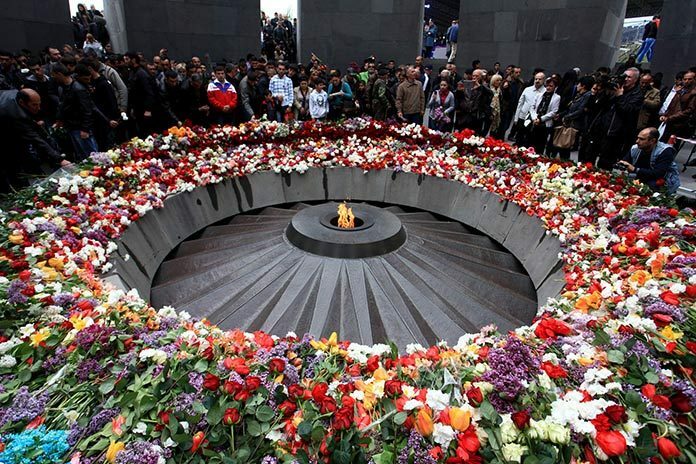 A multitude of people – locals, Diaspora, foreign guests – are visiting the hilltop Genocide Memorial at Tsitsernakaberd in Yerevan to pay their tribute to the memory of 1.5 million Armenians slaughtered by Ottoman Turks in the 1915-1923 genocide – remembered each year on April 24. Tens of thousands also marched to the memorial last night in a traditional solemn torchlight procession staged on the eve of every anniversary. The governments and parliaments of nearly three dozen nations, including Russia, France, Germany, Brazil, Italy, Canada and others as well as 44 states of the United States have recognized the mass killings and deportations of Armenians in the Ottoman Empire as a genocide. The government of Turkey, however, refuses to acknowledge the crimes committed against Ottoman Armenians. When the centennial of the Armenian Genocide was marked in 2015, Armenians pledged to continue to “Remember and Demand”. During the year after the 100th Anniversary commemorations Armenia has actively promoted the international agenda for the prevention of the crime of genocide, taking a stance against crimes against humanity in different parts of the world, including in the Middle East. Representatives from the global humanitarian community, including Nobel Laureates, academics, former statesmen, and others are in Yerevan these days as part of a new initiative seeking, on behalf of the Armenian Genocide survivors, to raise public awareness about atrocities occurring around the world today and reward individuals working to address those issues in a real and substantial manner. Hollywood star and activist George Clooney will present a $100,000 grant to the Laureate of the inaugural Aurora Prize for Awakening Humanity in a ceremony in Yerevan tonight. The Laureate will then invite his or her nominated organization(s) to the stage to receive the $1 million award. Today’s Genocide commemorations come weeks after deadly fighting in Nagorno-Karabakh during which Armenians have also accused Azerbaijan of committing ethnic violence against civilians, including the killing of elderly people and maiming of their bodies. Armenia has also accused Turkey of encouraging its ethnic cousin Azerbaijan’s Armenophobic policies.